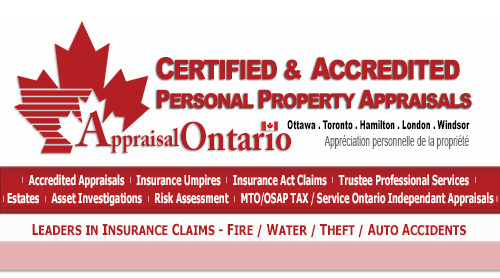 The APPRAISALOntario.com ("ACPPA ") web site was prepared by ACPPA for informational purposes only. The materials contained herein are not intended to, and do not constitute legal advice. This web site does not create a lawyer-client relationship. Internet subscribers and online readers should not act upon this information without seeking professional counsel. You should not send any confidential information to the firm until you have received a written agreement from the firm to perform legal services on your behalf. Unless you have received such a written agreement, we will not consider any correspondence you send us as confidential. Even if you receive such an agreement, you should note that e-mail may be intercepted by others. You may wish to consider using other means to send sensitive or confidential information. All materials contained on this site are protected by copyright. Re-publication, re-transmission, or other distribution without permission and appropriate attribution of authorship is prohibited. All requests for reprints of articles and other content should be addressed to: WEBMASTER. Requests will be reviewed and responded to as soon as possible. A response will usually be sent within two business days. If the ACPPA web site is linked to any other internet sites, resources, or businesses upgraded by other persons, you should be aware that these other sites are independent from ACPPA and ACPPA has no responsibility or liability for or control over other sites, their businesses, goods, services or contents. If you view other sites that may be linked to the ACPPA web site, you do so at your own risk and this will constitute your direct dealings with owners or operators of other sites. You may not alter or display any comments, communications or other data of any kind on the ACPPA web site with the intention that said postings may be viewed by other users of the ACPPA web site. The privacy of the users of this web site is respected by ACPPA . ACPPA will not use any personal information it may derive about you from your use of this web site for any purpose whatsoever except dealings direct with ACPPA . Of the ACPPA web site supercedes any and all previous agreements, written, oral or otherwise between you and ACPPA with respect to your use of the web site If any provision of the Terms and Conditions is found to be unlawful, void or for any reason, or unenforceable then said provision shall be deemed to be severed and the balance of the Terms and Conditions of the use of the ACPPA web site and shall not not affect the validity and enforceability of any remaining provisions. The parties have expressly requested and required that Terms and Conditions of use of the ACPPA web site and all other related documents being the English language. Les parties conviennent et exigent expressement que ce Contract et tous les documents qui s'y rapportent soient rediges en anglais. Of the ACPPA web site and all other related matters are governed solely by the laws of the Province of Ontario, Canada and any federal laws of Canada which may also apply, excluding any rules of private international law or the conflict of laws which would lead to the application of any other laws. Any dispute between you and ACPPA or any other person arising from or connected with or related to the use of the ACPPA web site must be resolved before the courts of the Province of Ontario in the City of Windsor, Ontario. By using the ACPPA web site you are hereby irrevocably submitting to the original and exclusive jurisdiction of the said courts. Any claim or cause of action you may have arising from, connected with or relating to your use of the ACPPA web site must be commenced in a court of competent jurisdiction in the Province of Ontario within six months after the claim arises failing which claim or cause of action is forever barred. All Payments / Retainers and or partial payments are NON-REFUNDABLE. There will be No Refunds or Credits given for any services. No Refunds or Charge Backs on Credit Card payments will be accepted or will be authorized. The charging of the clients credit card for the sole purpose of the fulfillment of the appraisal agreement and has been acknowledged and signed previously. In order to treat everyone equally, no exceptions will be made. Any payments made must have accompanied signed statement of account; signed appraisal agreement, signed appraisal proposal and proof of payment type. All funds must be "Cleared Funds" (meaning certified funds: bank drafts, online banking transfers, banking wires and or money orders) - No Other Acceptions Will be Offered or Allowed. 1. All Appraisal Reports; letters of opinion or any appraisal service in writing will not be given to any other party without the Appraiser’s written approval. NO ACCEPTIONS. 2. The Appraiser will report the type of value requested by the client by: researching the market and industry; apply the appropriate approaches to value, provide a written report of their findings and follow USPAP reporting standards. 3. The Appraiser and AppraisalOntario - LegalEASE is indemnified against any and all problems that may arise from the use of under section #1. 4. The CLIENT agrees to indemnify and hold the Appraiser and AppraisalOntario - LegalEASE harmless against and from any and all losses; claims, actions, damages, expenses or liabilities, including reasonable Lawyers/Paralegal’s fees, to which we may become subject in connection with any engagement. The CLIENT will not be liable for they Appraiser's negligence. 5. The CLIENT agrees that, in the event we are judicially determined to have acted negligently in the execution of any appraisal engagement damages shall be limited to an amount not to exceed the fee received by The Appraiser and AppraisalOntario - LegalEASE for the particular engagement. 6. The Appraiser and AppraisalOntario - LegalEASE liability for injury or loss, if any, arising from the services provided to the CLIENT shall not exceed $1,000. 7. There shall be no punitive damages. Increased liability limits may be negotiated upon your written request, prior to commencement of services. 8. CLIENTS Acknowledgement to personally guarantee to pay any invoice upon delivery. 9. ALSO to include all written; oral, electronic agreements or the continuation on with on going services. This will be an automatic omission and acknowledgment of an executed agreement between both parties, even if not all duly signed parties or signatures have formally been delivered. THIS INCLUDES any the act of the willingness of verbally sending / leaving voice mail messages; emails and phone conversations, will be constitute as a legal binding agreement. It will be deemed that the CLIENT has approved and acknowledgement previous terms and conditions of any prior agreement or statement of account, as long as it is a continuation of same said subject of valuation or professional services that is based on the entirety of the originating service. 10. The CLIENTS obligation for indemnification and reimbursement shall extend to any controlling person of "Your Business Name", including any director, officer, employee, subcontractor, affiliate or agent when not in any personal capacity of one specific individual has been executed previously. 11. If in the future the Appraiser is called on to testify in court or at deposition regarding the written report, the Appraiser will be paid the going hourly rate of $585.00 charged by the Appraiser to cover professional time; the gathering of materials, reviewing the case and preparing for testimony along with other expenses incurred. All disbursements such as mileage; travel time, meals, logging for hotel or motel costs, parking fees of the Appraiser(s) will also be paid by the CLIENT upon delivery of a statement. The going fee per hour along with reimbursements for testimony if subpoenaed as a witness in a subsequent litigation by any party and such testimony involves the work we performed pursuant to this agreement. If we are ordered by a provincial to permit the subsequent inspection and/or reproduction of files, records, and other documents relating to work performed by us pursuant to this agreement, it is agreed that we may comply with these orders without prior notice to the client will also be charged at the Appraisers disclosed hourly rates. 12. If The Appraiser and or AppraisalOntario - LegalEASE is called on to defend this report to any other party, the Appraiser’s expenses and hourly rate of $585.00 will be billed and payable prior to attending. An invoice will be sent to the CLIENT outlining blocked fees and disbursements payable or as incurred. These monies will be paid prior to providing any professional services will commence. 13. The CLIENT will shoulder the responsibility of legal costs incurred by the Appraiser and or AppraisalOntario - LegalEASE when defending any Appraisal, or appraisal services. 14. CLIENT agrees by receiving any draft report, or finished report - that the Limiting Conditions, as stated in any report, will be acceptable with the level of work and detail of work to be performed as outlined in the Scope section of the report. A sample of the Scope Section has been provided and received by the client prior to starting any assignment. 15. Only the larger items of the assets will be appraised using the whole range of Appraisal methodology. The balance of smaller support items will be valued by way of industry depreciation standards and historical metrics. These smaller items will be valued and reported in "lots" or bulk. These items will not be counted individually due to the outlying costs or otherwise negotiated separately. 16. In the unlikely event of a dispute, both parties under the TERMS AND CONDITIONS OF ANY APPRAISAL SERVICES shall be subject to arbitration. Arbitration shall be conducted in the city of residence of the Appraiser. 17. If arbitration is not successfully under number 16, or number 6 of the 'Terms and Conditions of Any Appraisal Services' then any action in Provincial Court will be commenced any or all court proceedings shall be in the city of the Appraiser. 18. The CLIENT agrees to have any or all court proceedings in the city of the Appraiser and will not make any court motion of courts jurisdiction variance or likewise try to change number 17 and number 18 of these publicly posted 'Terms and Conditions of Any Appraisal Services'. 19. The Appraiser and AppraisalOntario - LegalEASE is not responsible for any additional delays receiving your order because of; computer/system errors, partial client disclosure, holidays, any 3rd party delivery companies and Canada Post. 20. All orders will be sent to the client in a DRAFT form, of which the client MUST confirm that the order was received by email only. The original paperwork will be then sent as per the order requests only. 21. ANY charge back or Pay Pal disputes of any service is subject to all terms and conditions from 1 thru 20. The CLIENT agrees in advance that they cannot issue any Pay Pal payment dispute for any reason other than they did not receive the DRAFT copy of the order within 45 days of the date of submission. The CLIENT agrees to section 19 of this TERMS AND CONDITIONS OF APPRAISAL SERVICES. That NO REFUNDS will be issued for anything clearly disclosed in section 19. 22. If the CLIENT makes a payment dispute for a charge back regardless of section 19, then the CLIENT will be subject to the "PENTALTIES CLAUSE" listed in TERMS AND CONDITIONS OF APPRAISAL SERVICE. 1. All Appraisal assignments; consignments or any sub contractors/Independent Contractor that have been given appraisal assignments to conduct in their service areas - are responsible for themselves. AT NO TIME WILL APPRAISALONTARIO-LEGALEASE WILL BE HELD RESPONSIBLE OR LIABLE for an Independent Contractor’s Injuries incurred during their duties and responsibilities in a Professional or private capacity. NO ACCEPTIONS. 2. The Independent Contractor’s Injuries incurred while conducting an onsite inspection are the sole responsibility of the Independent Contractor.They must use common sense and best judgment not to put themselves in harm way, or perform their duties in a safe environment only.At no time shall a Independent Contractor act in any harmful environment. NO ACCEPTIONS. 3. All Independent Contractor’s will report to AppraisalOntario-LegalEASE in any case there was such any type of injury with providing only a written doctors intake form at any Provincial Hospital Emergency Department. This must be provide within 24 hours, so that another Independent Contractor can fulfill the assignment in their absence. NO ACCEPTIONS. 4.AppraisalOntario-LegalEASE nor any Appraiser that provides assignments will be held personally responsible, or will be held liable at anytime for all Independent Contractors. NO ACCEPTIONS. Penalty of Fine - By acceptance of the appraisal report; viewing all or any part of the appraisal report, will be deemed to AGREE and ACKNOWLEDGE to all the terms; conditions and legal disclosures of sections 1 thru 22 of the TERMS AND CONDITIONS OF APPRAISAL SERVICE. Therefore, by any breach of any of the TERMS AND CONDITIONS OF APPRAISAL SERVICE named in the appraisal report will result in the penalty of fine of equal to, or otherwise previously stated to be triple (3 times) the cost charged by the Appraiser for the production; communication, legal fees, disbursements and all time involved of the appraisal services. The Appraiser will notify in writing of any breach that has occurred and full written reasons for the enforcement of the Penalty of Fine. As part of the TERMS AND CONDITIONS OF APPRAISAL SERVICE, there will be only 5 days given for the reason(s) of the parties that are in breach. All parties must reply in writing before this deadline to be considered not to result in the financial due and payable upon delivery of an invoice and demand for payment. This 5 day period is solely to provide a commercial reasonable time period to clarify any misunderstandings or make a written apology; written retraction or financial donation to a chartered charity in the name of AppraisalOntario-LegalEASE. The payment of the penalty of fine will be paid immediately upon receipt of the presentation of the invoice and is an ‘Unconditionally Personal Guarantee’ to pay immediately. The reader(s) of person(s) who have possession of this report, hereby agrees to waive any right(s) or entitlement of a Defense/Claim of the penalty of fine against of any proceedings of a Claim for damages in any Provincial Court. It is further acknowledgement that this claim for damages will constitute an automatic Default of Judgment against the person(s) that have breached the above TERMS AND CONDITIONS OF APPRAISAL SERVICE. American Society of Appraisers - ASA - International Society of Appraisers - ISA - Appraisers Association of America - AAA - Canadian Personal Property Appraisal Group - CPPAG - Plus many USPAP - Independent Certified Personal Property Appraisers. Access to the ACPPA web site may not be legal by certain persons or in certain countries. If you access the ACPPA web site from outside the Province of Ontario you do so at your own risk and are responsible for compliance with the laws of your jurisdiction. Thank you for your cooperation. We hope that you find the ACPPA web site helpful and convenient to use. © Copyright © 2008 - AppraisalOntario.com All Rights Reserved.